People are increasingly bothered by Satanic possession. "The Devil made me do it." is an excuse frequently offered by the criminal. The "Crime Fighting Device" was invented by Reverend Clayton Bailey in 1985. 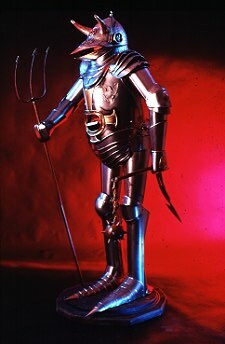 It is a full-size suit of armor for the Devil, and it uses satanic power to help people, rather than to hurt them. 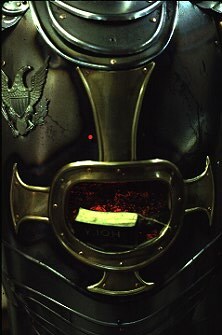 The armor has the "number of the Beast", (666) tattooed on its forehead, and it is adorned with several inverted crosses and pentagrams. Peering tinto the faceplate of the helmet, one can see the skull of Satan inside. A pile of Bibles are burning in its belly. Bailey says, "If you stare at the Crime Fighter for a few minutes, and then look away, you can actually see the "psychic antibodies" that are created in your eyes. Jenner's inoculation of humans with weakened smallpox virus created antibodies against more serious infection by the disease. Likewise, mildly anti-religious and Satanic symbols enter the eyes as an innoculation to protect the viewer against a more serious invasion by Satan. A silver coin lies on the ground, behind the figure. But don't bend over to pick-up the coin, because it will put your lips near the Devil's buttocks, and if you kiss the Devil's buttocks, you will lose your soul to Satan. 30" X 30" X 72" Ht. Fire of burning Holy Books emits a shocking psychic assault on the eyes, and the mind creates anti-satanic antibodies in response to the visual experience. This phenomonon is known as a visual vaccination, and is based upon the theory that "like cures like", or sympathetic affinity.. According to the concept of "psychic immunization", psychologically charged symbols create an immune response in the viewer, in this case, protecting the viewer from possession or temptation by Satan.